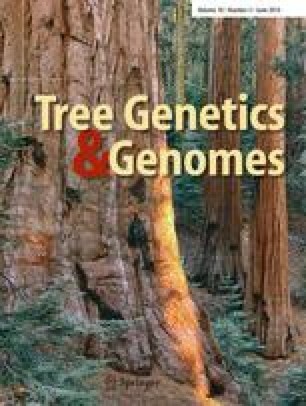 Molecular analysis of natural root grafting in jack pine (Pinus banksiana) trees: how does genetic proximity influence anastomosis occurrence? Natural root grafting has been observed in more than 150 tree species where up to 90 % of trees could be interconnected within a stand. Intraspecific root grafting was previously found in Pinus banksiana stands, ranging from 21 to 71 % of trees grafted with one another. It is not known why root grafting is frequent in some species and not in others, or why not all roots that cross form root grafts. We investigated genetic diversity of grafted and non-grafted trees to determine if there was a relationship between genetic distance and the probability of forming natural root grafts. Seven plots were hydraulically excavated in four natural forest stands and three plantations of P. banksiana in the western boreal forest of Quebec, Canada. At pairs scale, we studied the effect of geographic and genetic distances on root grafting occurrence. At stand level, we analysed the effect of tree density, soil type, stand type and mean pairwise relatedness on the mean number of grafts per tree and on the percentage of grafted trees per plot. At pairs scale, our analysis revealed that root grafting presence was influenced by spatial distance between trees and less importantly, by genetic distance between individuals. At stand level, root grafting frequency was correlated with stand type (greater in naturally regenerated stands), but not with genetic diversity between individuals. In conclusion, root grafting appears to be principally linked to tree proximity and slightly to genetic proximity between individuals. The authors thank the Natural Sciences and Engineering Research Council of Canada (NSERC-CRSNG), CRSNG-UQAT-UQAM Industrial Chair in Sustainable Forest Management and the University of Quebec in Abitibi-Temiscamingue. We would like to thank the Quebec Ministry of Natural Resources and Wildlife (MRNF), Materiaux Blanchet Inc. and Foret et Recherche Harricana for their help in locating plots. We also thank the Centre for Forest Research (CEF), Bill Parsons for his help on language revision, many students and technicians for field work, Noémie Graignic for her ArcGis advice, Xavier Cavard and Marc Mazerolle for their help with statistical analyses. Finally, we would like to thank anonymous reviewers for their comments that help improve the manuscript. GPS data and SSR genotype data were submitted to TreeGenes Database. Accession number is TGDR008.